The first thing most smartphone users do when they get themselves a bright, shiny new device is to get themselves a case for it. I'm not among them - I prefer my iPhones sans cases of any sort as I absolutely believe that they kill the sleek look and feel and jewel-like touch that Apple works so hard to achieve as part of their design process. For me, whether it's an iPhone 4S or an iPhone 5, the unadorned device in all its sleekness is what I want and what I have. Interestingly, when I got myself an iPad 4 and began using it as my go-to device for plane travel (as well as for Acela Amtrak service between Stamford, CT and Boston), I found that I became entirely too skittish carrying an unadorned iPad 4 around. Why? Well, one day I had my iPad out and in hand just as Delta began calling up its first class passengers. As I don't tend to fly first class I was not paying attention to the movement of fellow passengers towards the gate. As it happened, a first class passenger (I really want to call whoever it was an uncaring idiot, but I'll settle for "fellow distracted traveler") rushed by me and not only managed to somehow clip my iPad screen with the metal edge of a buckle on his laptop bag, but also managed to almost have my iPad go flying out into left field. I managed to catch it in full flight (!) and breathed a great sigh of relief in noting that the screen itself remained intact. I turned to thank my fellow distracted passenger but he was long gone down the gate and I never did quite figure out who it was. Well, that was enough of a trauma for me - I immediately decided that while my iPhones would remain distinct and uncased, I needed protection - real protection - for the iPad. After looking around for a good bit I settled on an iPad case from STM dubbed the grip - STM uses all lower case letters for it - so it isn't the Grip, but most definitely the "grip" - go figure. The MSRP on it is $45 but $25 at Amazon will certainly put one in your hands. I got mine in contemporary orange, and I have got to say that this has proven to be a great investment for me. The grip offers a beautifully textured and rubberized finish, along with a built is stand that allows the iPad to sit in either a vertical or horizontal position for viewing, as well as at a more shallow (less angled) horizontal position better suited for typing. The iPad snaps cleanly and neatly into the case and the cover turns the iPad on and off exactly as Apple's own iPad covers do. There is not in fact a whole lot more to say about it - but that is a very good thing. It adds only a tiny bit of heft to the iPad itself and the case feels so good in hand and looks stylish enough (at least to me) that I feel no need to worry about losing the "Apple aesthetic" I crave with my iPhones. The result? All skittishness has disappeared and I am back to being fearless. Complaints? Only one very minor one - although the back of the case has the requisite cutout for the iPad's camera, the cover does not. If the cover is folded back it makes it impossible to use the iPad to snap any photos. Perhaps STM should put a porthole there, but on the other hand this issue has only occurred once in over four months of use - whether traveling or at home, so perhaps it is a non-issue. Still, I would prefer the porthole or an ability to slide something to uncover the camera lens when the cover is folded back. Of course, being a tech media guy I called up the folks at STM to let them know I was thinking of writing a review and I mentioned my one little complaint. They understood, but I certainly won't hold it against STM if they don't put the porthole in. I'm mighty satisfied with no longer feeling skittish! 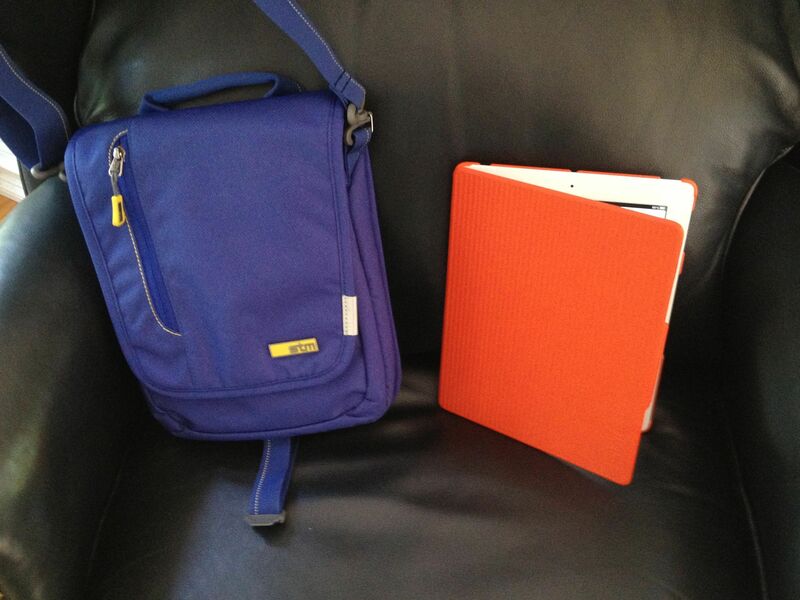 In talking with STM, their media person asked me if I would be interested in also reviewing an entirely new line of tablet bags the company was about to introduce dubbed the "linear for iPad shoulder bag" - again, all lower case. I confess I laughed loudly at the thought initially but my new STM friend convinced me to give it a whirl so she sent me one in contemporary blue to compliment my orange grip. Well, I never would have guessed that I would be thankful for the suggestion! When I travel I always check my bag and usually put my relatively large laptop bag up in the passenger baggage compartments, while taking my tablet and sometimes my laptop with me to my seat. Although the grip has relieved me of my sense of impending trauma in terms of the iPad being damaged, I do also have a very great fear of leaving the iPad behind in the seat compartment of the plane. I did it once and it was a huge hassle to backtrack and retrieve it. So I have lived in fear of doing so again, and typically I go through a ritual of sorts to ensure I don't ever forget it again. Well, here's what happened when I took the STM linear with me for the first time. The bag itself is featherweight and quite small. I can put a number of things in there including the iPad of course, and it is absolutely no bother what so ever to carry it and my laptop bag onto the plane. The difference however is that I no longer need to extract the iPad from the laptop bag - the linear simply comes with me to my seat and essentially disappears from sight since it is so small. However, at least for me, because it is a bag sitting under my seat, I don't ever forget it but I also never need to think about it - meaning that my days of worrying about leaving my iPad behind have gone the way of my former skittishness about the iPad getting damaged. I never would have guessed but for me the linear - which has a street price between $30 and $40, is a clear win. And unlike with the grip, I have no complaints with the linear. The combination of the two has proven indispensable to me. Finally, it's not only about business travel. When my wife and I head out to Martha's Vineyard this summer there will be no "embarrassing" (to my wife) laptop bag coming with me to either Martha's or its beaches - it'll be me, my wife, some friends, lots of wine and my fully STM-equipped iPad. BTW, I will also note that the STM linear will of course support any ten inch or smaller tablet from any vendor. It needn't be an iPad. The photo above is of my own STM entourage. Interested readers can view a large array of photos and many other details directly at the STM website itself so I did not take a lot of photos. Check it out - you will likely end up as surprised as I was. In short, both the linear and grip are highly recommended. But yes, sorry STM - my iPhone will always remain unadorned, sleek and jewel-like.